According to a news report, General James Conway, Commandant of the U.S. Marine Corps, is looking at using the Joint High Speed Vessel (JHSV) as a Marine troop carrier. He is concerned that new US Navy transport ships lack a well deck to launch their equipment at sea. But it occurs to me that the Marines simply drive their Amphibious Assault Vehicles (AAV) off the ramp of the well deck, they don't flood the deck unless unloading a landing craft. The JHSV is designed with a rear ramp to unload Abrams main battle tanks. The ramp could be lowered into the water and the Marines drive their AAVs off the end. This would also have the advantage that the AAVs could be launched when the ship is underway. It may be possible to recover the AAV's replacement the Expeditionary Fighting Vehicle (EFV) at speed on water. The US government is deploying the Australian designed 113 metre high speed catamaran “Huakai” to assist with Haiti relief. Completed last year as a vehicle ferry for Hawaii, the ship can carry up to 800 tonnes at 40 knots. It has a shallow draft of 3.7 m, water jets and 20 metre ramp, allowing it to dock and unload without assictance. It is likely the ship will shuttle between Haiti, Guantanamo Bay and Miami. A similar operation was carried out by the high speed catamaran HMAS Jervis Bay, operating between Darwin and East Timor from 1999 to 2001. Like Huakai, this was a surplus commercial ferry taken up for government use. The US military were impressed with this and leased a number of Australian designed catermarans. 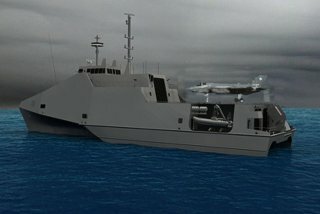 The US Department of Defence has contracted Austal (who built the Huakai), to build up to ten similar "Joint High Speed Vessels" (JHSV) for military transport. The first named “Fortitude” (JHSV 1) is being constructed in the USA. Tjhis will be followed by Vigilant (JHSV 2) and Spearhead (JHSV 3). The Australian Transport Safety Bureau (ATSB) has released a preliminary report on the collision between Jessica Watson's yacht Ella’s Pink Lady and the bulk carrier Silver Yang off Point Lookout, Queensland on 9 September 2009. While media reports have questioned the wisdom of a teenager solo sailing, what comes through in the dry technical language of the report is of a skipper acting calmly under pressure. After the collision the report says the skipper, seeing the mast was about to collapse retreated to the cabin, assessed the yacht was still seaworthy, radioed the Silver Yang that assistance was not required, reported the incident and returned to port. Ella’s Pink Lady was equipped with an Automatic Identification System to detect other ships electronically, a radar, a radar enhancer (to make the yacht show up better on radar). Navigation equipment included fixed and hand-held magnetic compasses, four GPS units, an integrated electronic chart-plotter/radar display and a laptop computer with a back-up electronic charting system. Also there were two VHF radios, a high frequency (HF) radio, an Inmarsat-M satellite email/telephone and an Iridium satellite telephone. The ATSB investigation is continuing. According to "Navy the Big Winner - but but when" (Kym Bergmann, Asia-Pacific Defence Reporter, May 2009), the Australian Government has decided to rationalise the Navy's patrol boats, mine counter measures, hydrographic and oceanographic vessels into one class of twenty "Offshore Combatant Vessels". These will be larger than the current patrol boats, at up to 2,000 tonnes. This would appear to be the role the Austal Multi-Role Vessel was designed for. The MRV can be thought of as an Armidale patrol boat welded onto the front of a Joint High Speed Vessel (JHSV), making a lightly armed trimaran which can also carry containerised loads and operate a helicopter, or even a F-35B. Austal have proposed a long range, high speed, patrol ship called the Multi-Role Vessel (MRV). This is essentially the Independence-class littoral combat ship (LCS), which was designed for the US Navy, but with the expensive weapons and electronics removed to make a lower cost, long range multi-purpose ship for military and policing purposes. The MRV is a trimaran with one large hull in the middle and two outriggers. This gives a wide area accross the three hulls at the rear for cargo and a large helicopter flight deck on top. The wider hull projecting at the front provides good sea keeping and space for weapons and sensors. The slim outer hulls allow for high speed. The design from West Australian based Austal has been selected by the US Department of Defence for the Joint High Speed Vessel (JHSV), worth around US$1.6 billion, if all ten ships are built. The aluminium 103-metre ship design is derived from that of Austal's car ferries, one of which, the “WestPac Express” was leased to the US Marines. Austral's main rival is also Australian: Incat of Hobart, who have also leased ships to the US military. One reason for Australia's success in building such ships is expertise in welding aluminium. The JHSV ships will be built in Mobile, Alabama, USA, not in Australia. These vessels are likely to be less controversial than the Littoral Combat Ship, USS Independence (LCS 2), being completed by Austal. The Independence was due for sea trials in early 2009. But both it and the competing design from Lockeed Martin (USS Freedom LCS1) have had problems with delays and cost overruns. See: "Checkered Past, Uncertain Future" By Commander Otto Kreisher, U.S. Navy Reserve (Retired) in Proceedings U.S. NAVAL INSTITUTE, January 2009. Unlike the complex weapons and sensors used in the LCS ships, the JHSVs are more basic conversions of civilian transport ship design. Also the role of the transport ships is less controversial. This raises the interesting possibility of using the JHSVs for some of the roles envisaged for the LCSs. The LCS are designed to use removable "mission modules". These are typically housed in ISO shipping container sized units loaded onto the ship as required. Some of these modules contain off board sensors and weapons, such as UAV helicopters and some the control consoles. Such containers could easily be accommodated in the JHSV's large interior . Modern computer technology may make much of the mission modules unnecessary. Modern sensors and weapons can be controlled from ordinary laptop and desktop computers, with no need for specially designed operator consoles. Therefore the ships could be equipped with general purpose computer consoles which could be used for whatever sensors or weapons were placed on board. In other cases the operators of the modules could arrive carrying the laptops needed to operate the equipment. The JHSV's are designed for roll-on/roll-off operation with a rear ramp allowing large articulated trucks with shipping container sized units to drive on board. Equipment designed for field use by the military could therefore be driven onto the ship and operated on-board, without the need to develop special modules or interfaces. Equipment from the Army, Navy or Marines could be used on the ship. The generous space available would remove the need for expensive compact packaging of equipment and the design lead time which goes with it. Clearly the JHSV's could not do every role the LCSs are intended for, but could many of them and at a lower cost. The Australian designed USS Independence (LCS-2) was launched on Saturday. This is one of two competing prototype littoral combat ships for the US Navy. These are relatively small (127-meter), fast (90 km/h) ships with small crews (40) and flexible weapons mix. Perhaps the Australian Government should acquire some of these ships, as they can be made in Australia. The Independence is more radical looking, than its rival, USS Freedom (LCS-1). Independence has a trimaran hull, looking like one of Austral's car ferries at the back with half a warship welded onto the front. In contrast Freedom is a conventional single hull warship. The Independence design provides advantages with more deck space for helicopters and more storage, but creates a large shape which will be easier to detect, than the Freedom. Austral is also one of the two Australian makers of high speed transport ships for the US military. The project has been controversial. Some argue that more conventional, cheaper proven designs for the US Coast Guard would be better, such as the USCGC Bertholf. The practicality of the flexible weapons mix has also been questioned. Independence is one of two LCS seaframes being produced. LCS 1, Freedom, completed its acceptance trials and was delivered to the Navy on Sept. 18, 2008. Freedom is scheduled for commissioning on Nov. 8, 2008. The LCS is an innovative combatant designed to operate quickly in shallow water environments to counter challenging threats in coastal regions, specifically mines, submarines and fast surface craft. It is capable of speeds in excess of 40 knots and can operate in water less than 20 feet deep. goal of at least 313 ships. In May 2004, the Department of Defense awarded both Lockheed Martin and General Dynamics separate contract options for final-system design with options for detail design and construction of up to two LCS ships. The future USS Independence (LCS 2) is the General Dynamics’ lead hull in that ship design. In October 2005, the Department of Navy awarded General Dynamics - Bath Iron Works, a contract for detail design and construction of their first LCS. General Dynamics - Bath Iron Works teammates include Austal USA of Mobile, Ala. and General Dynamics – AIS of Pittsfield, Mass. A keel laying ceremony was held Jan. 19, 2006, at Austal USA Shipyard in Mobile, Ala., where the ships is being built. In "Widen the Lens for JHSV" (Proceedings of the U.S. NAVAL INSTITUTE, June 2008 Vol. 134/6/1,264), Commander Robert K. Morrison III and Lieutenant Commander Phillip E. Pournelle (U.S. Navy) suggests widening the role for high-speed vessels. Morrison and Phillip were the commanding and executives officers of HSV-2 Swift, an experimental Australian built US navy high speed ship. The US DoD has a Joint High Speed Vessel (JHSV) program designed to implement the results of the programs run my US Army and Navy. However, Morrison and Phillip argue that the joint program has lower performance requirements than those demonstrated by Swift in actual operations and will unnecessarily limit the uses which such ships can be put. The authors argue that the JSHVs should be thought of like transport aircraft more than ships. They can quickly deliver a cargo, or a military force and rapidly leave the scene, under cover of dark if necessary. The ships can operate from undeveloped ports without the need of shore facilities using their built in vehicle ramps and cargo arms. They can carry tanks, carry helicopters and deploy small raiding craft. Australian industry has an interest in this debate, as it has two shipbuilders: Incat and Austal who dominate world as suppliers of such ships.